Bruckner is a supplier of textile dry & wet finishing ranges. Main products are open width processing range, tubular knit processing range, padders, stenters, relax dryers – witro all from made in Germany. Processing Machines, Jigger / Jumbo Jigger, its frame is made of graded cast-iron rigidly connected by means of mild steel tie bars. We are a unique entity in the industry, actively committed to offering an optimum quality range of Textile Processing Machinery. We offer our services for Textile field including Micro Dot Coating Machine, Scatter Coating Machine / Chemical Coating, One Side Fine Polymer Coating Machine Like Acrylic, Polyurethanes, Pvc, Stiff Venation Blinds, Parachute Cloth, Tent Material And Other Technical Textiles. 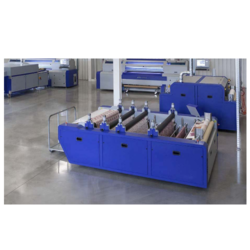 For fabric finishing, we have two 7-Chamber Stenters that are fully-automatic. They also enable control of moisture, bowing and skewing in the entry and exit of the machine. Imported from Monforts, Germany, the stenters can finish nearly 100000 mtrs of Cotton and PET/Cotton fabrics. The finished width ranges from 40 cms to 325 cms. Stenter is an oil heated machine. It is one of very important technology in processing of fabrics. It is very expensive but much needed for a processing unit to get desired width of a fabric. It is used for polyester fabric processing to maintain structure and to get good color brilliancy of fabrics. 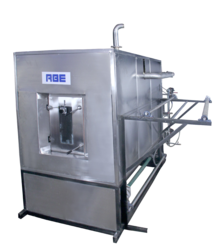 We are engaged in supplying of a vast range of Yarn Preparatory Machines which includes Covering Machines, Winding Machines.